The Parenting List has been revised to reflect our current collection. If you are looking for books pertaining to Raising Children, Divorce, Grief and Loss, etc., click on "Parenting Books" under "Booklists" in the right hand column. 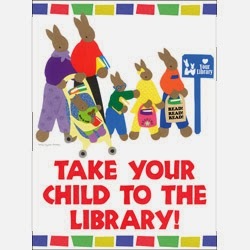 You can also pick up a paper copy in the Children's Room of the library. Please note that we also have paper copies of other booklists available as well. The Summer Calendar of Events for Children is ready! Just click on the scientist to the right. Copies are available in the library and will soon make an appearance in your child's backpack. Plans for Summer are Underway! Story Time begins Tuesday, June 24 at 10:00 am and Discovery Time will start on Wednesday, July 2 at 10:00 am. A calendar will be available soon!! is ready and can be viewed by clicking on the snowman to your right. Copies will be distributed through the schools and at the library. Hope to see you at the library! January is The Snowy Day Month, a time to celebrate Ezra Jack Keats books and have fun in the snow (or mixed precipitation, as the case may be). Watch the animated story or help Peter collect snowballs with The Snowy Day Game. It's fun indoors play for when the temperature is too low or there's too much sleet to be outside.